Location: Pirin Golf Hotel and Spa is a 5-star hotel, planned as a state-of-the-art building, located northeast from the main gate of the Pirin Golf & Country Club overviewing the 14 hole of the Ian Woosnam Golf Course. 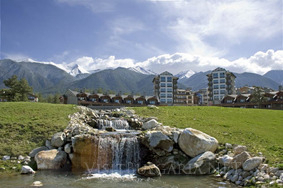 The landmark Pirin Golf Hotel is situated to the north of the internal scenic road and borders Hole 14 of the Ian Woosnam Championship Golf Course. Located in a picturesque scene of virgin woods, majestic slopes and crystal mountain springs, the hotel and the modern SPA are within easy reach of Sofia to provide a sense of calm and privacy. Accommodation: Pirin Golf Hotel and Spa features four blocks, situated perpendicular to the main road, with beautifully laid out interiors, recreational areas, pools, green alleys. The 5 star hotel has its main entrance on the east side of the complex. It offers 84 comfortable rooms and 8 apartments with magnificent view over the 14th and 16h Holes of the Ian Woosnam Golf Course. The direct connections with the SPA and Conference centers round up the character of the hotel as a truly multi-purpose facility. The Aparthotel - the second wing of the hotel complex includes a total of 305 studio apartments and 20 maisonettes. Some of the apartments on the ground floor offer a direct access to the gardens. The studio apartments feature a living room with kitchenette and a bathroom. The maisonettes offer a living room with kitchenette, dining-hall and bathroom on the first level and sleeping rooms on the second level, respectively. It is designed as a complex of four attached buildings positioned perpendicularly to the main road with beautifully landscaped internal recreational areas, alleys and gardens. The eastern wing is conceived as a five star hotel, while the other three bodies include vacation apartments. All four buildings are interconnected by the SPA & Wellness Center. The SPA & Wellness Center is situated on three levels underneath and between the main bodies of the hotel and the aparthotel. The first level includes a reception with a spacious waiting room, a beauty center, as well as a large swimming pool, which is connected to an open-air swimming pool. Here you can also find the VIP zone and the sports area, a doctor’s consulting room and a fitness bar. Conference halls: On the second level the SPA Center offers a series of three conference rooms, which can be united into one big hall thanks to specially constructed sliding doors. Right next to the conference area is located a dining hall which has a staircase connection with the upper level. Finally, here you can find another sports activity possibility with two squash rooms and separate showers and changing rooms. Wine and dine: Italian Restaurant serves delicious pizza, spaghetti, pasta and other meals from the Italian and international cuisine in an enjoyable atmosphere, garden and professional service. The main restaurant offers a fireplace, a barbecue and live music every evening. The restaurant also has a cosy terrace overlooking Pirin mountain. Pirin Golf Hotel and Spa offers a varied nightlife. For connoisseurs of nightlife entertainments, the complex will have several restaurants with live music, piano bar, nightclub and traditional Bulgarian tavern.